French Presses are almost mythical. They’re synonymous with perfectly flavored brew, heavenly aroma, and a coffee snob attitude to life. And key to their legendary status is their functioning. You can’t just buy a French Press one minute and start whipping up Oscar-worthy joe the next. There has to be a perfect balance between precision and timing that only experience can teach. Or at least that has always been the case! But KitchenAid’s latest contraption is set to turn things completely upside down. 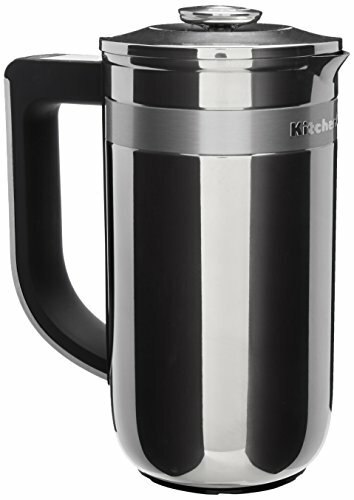 The KitchenAid KCM0512SS Precision Press Coffee Maker is designed to take the mystery out of this revered brewing method, and place the power to make delectable cups of java in the hands of newbies. But it doesn’t come cheap though. Priced at $124, this machine considerably costs more than the competition. Wondering what gives KitchenAid the guts to slap on such a price tag? Well, read on! 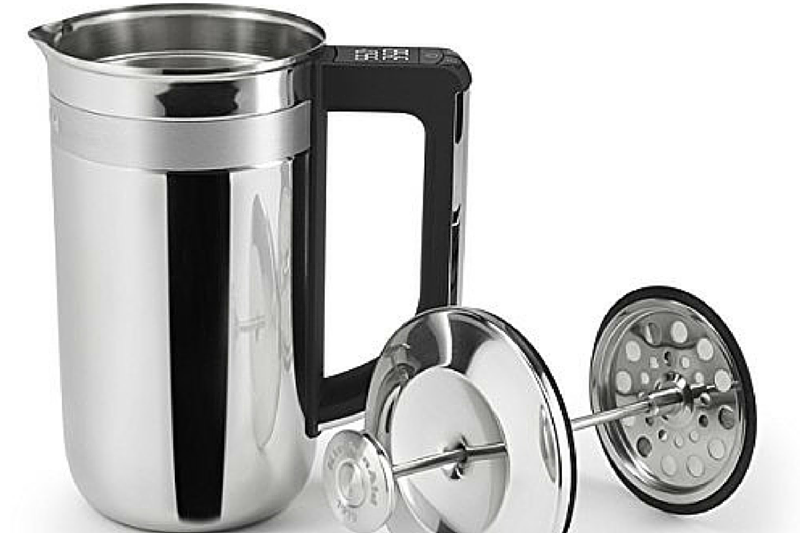 At first glimpse, this coffee maker looks like most other French Presses. It has that familiar jug-shape with a lid that comes with an integrated plunger assembly. It has to be said though, this baby is a stunner! Majority of the body is finished in gleaming stainless steel, which would make any of your guests drool with envy. 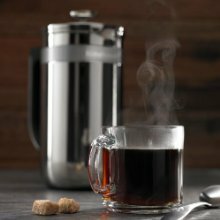 The pretty sizable 25oz capacity is housed in dual stainless steel walls, designed to keep your joe piping hot for quite some time. Sleek, cordless, compact design reduces countertop clutter. But when you look at the soft-gripped, huge handle, something immediately jumps at you. Right there at the top, lies an LCD screen with 3 buttons below it. What is all this wizardry, you ask? Well, this is what makes the Precision Press so special! This gadgetry is what controls the integrated scale and timer, designed to take much of the guesswork out of brewing. Dual wall stainless steel construction for optimal heat retention, ensuring proper extraction and optimal flavor. One button powers on the electronics, the other activates the scale, and the last initiates the timer. All this is fueled by 2AAA batteries, which you put into place by opening the battery compartment using a Philips screwdriver. Yeah, you need a tool belt to brew a cup of coffee! 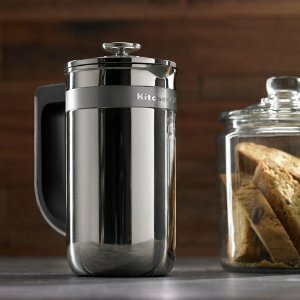 It functions essentially like any other French Press, only that now you have a bit of tech to guide you along your path to deliciousness. You first need to ensure you have your coffee, coarsely ground, and your kettle of hot water. At this price point you’d probably expect it to have some sort of heating mechanism, but sadly this isn’t the case. This beauty eliminates the need for a separate scale and timer. 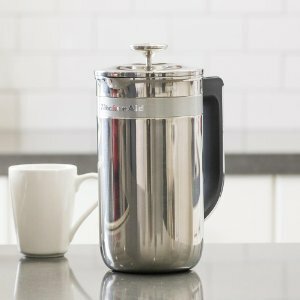 If you’re a complete newbie to this type of brewing, you can lean on the manual to give you instruction on just how much coffee and hot water to use. The scale is activated immediately you press the power button, after which you should pour in the target weight of coffee grounds. Press the scale button to reset it back to zero and add the required amount of hot water. At this point you should be hit with a heavenly aroma; take a nice whiff as you give the mixture a good stir. Now pull the plunger completely up, place the lid on the pot, and press the timer button. The steeping time is set for 4 minutes. Once this elapses, slowly press down the plunger to filter out the grounds, pour out a cup, and relish the rich flavor that is French Press-made java. The integrated scale and timer sounds like a pretty nifty idea, and it really is of massive help to first time users, but truth is, you grow out of it really fast. 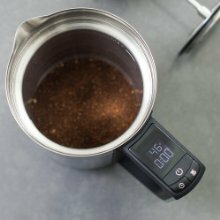 After brewing a half dozen pots or so, you’ll get a feel of just how much coffee and water you need to put. So unless you’re really keen on getting your grounds correct to the gram, you’ll find it much easier to work without this feature. And the fact that the scale keeps acting up every now and then doesn’t help matters either. For a machine costing in excess of $100, it’s sad that it doesn’t have a buzzer to alert you when the timer is done. C’mon KitchenAid! So you actually have to watch over the pot as it brews; oh those 4 minutes can seem like a lifetime. But there are a lot of things the Precision Press does right. It does a remarkable job at filtering out the grounds, with the plunger making one of the best seals out there. So you don’t have to contend with annoying grounds floating about in your coffee. 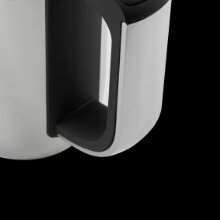 The dual walls of the stainless steel pot are brilliant at keeping your java nice and hot; maybe not as steaming as vacuum-lined walls, but definitely much better than glass carafes. French Presses don’t have as many moving parts as other coffee makers, so cleaning is never much of an issue. But the electronic aspect of this coffee press mean you can’t just toss it into the dishwasher and get on with your day. You have to employ the ancient art of hand washing. So if you’re always strapped for time, then cleaning might prove to be a bit of an inconvenience. Thanks to the perfect mix of precise weight and time, the brew is on the verge of divine. It has a complex and bold flavor profile that will make even the most snobbish of coffee aficionados blush. But it takes some time to settle on the ratio of grounds to water that works for you. The suggested one on the manual produces brew that is a bit on the weak side. If you’re one of those java-junkies that pretty much snort caffeine, you’ll have to up the grounds. Great insulation on the carafe. Sturdy filter and proper seal. No alert when the coffee is ready. 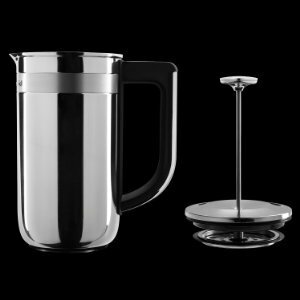 The KitchenAid Precision Press coffee maker sets out with a pretty noble objective: to demystify the workings of the French Press. For beginners, all the gadgetry might actually be of help. However, the KitchenAid’s extra features are a lot like training wheels; eventually you’ll grow into a know-it-all and stop using them altogether. If you’re simply looking for heavenly flavor, this coffee press won’t let you down. But if it’s the best bang for your buck that you’re after, then you’re better off getting a more affordable French Press, and investing in a kitchen scale and one of those things they call watches.